Full confession. I’m not a ‘health food’ fan. I’m certainly more than a meat and potatoes guy, but I am a carnivore and the list of vegetables I don’t like is longer than the list of those I do. 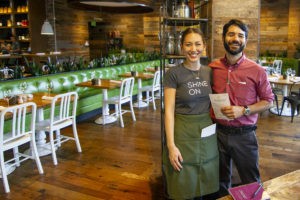 Let’s say I was slightly skeptical when I paid a visit to True Food Kitchen in El Segundo. We received a warm greeting from GM Laurence (Larry) Scher, who introduced us to our server Brittany. 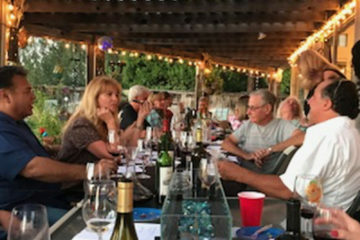 They had prepared a special menu for our group of writers from the International Food Wine and Travel Writers Association. 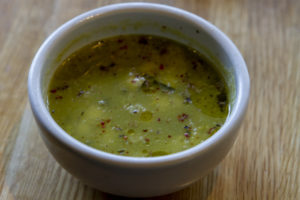 We began with the featured spring soup, asparagus and leek with fresh house made croutons, aleppo pepper and lemon oil. I had a feeling right off the bat that True Food Kitchen was about to change some of my preconceived ideas. 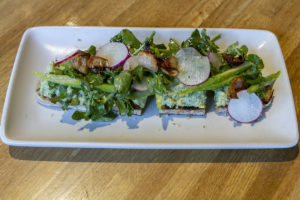 Alongside the soup we enjoyed an absolutely delicious spring asparagus toast with roasted cipollini onion, green garbanzo, tahini, mint and hemp seed. Even though I’m not normally fond of asparagus, I wound up cleaning my soup cup and every plate that followed. We were each given small containers of two unique foods, black walnuts indigenous to the Himalayas and green garbanzos, picked early. Both have immense health benefits including digestion, skin and eyes. Larry told us that the menu changes quarterly with the seasons. The menu is the same at all 24 locations. 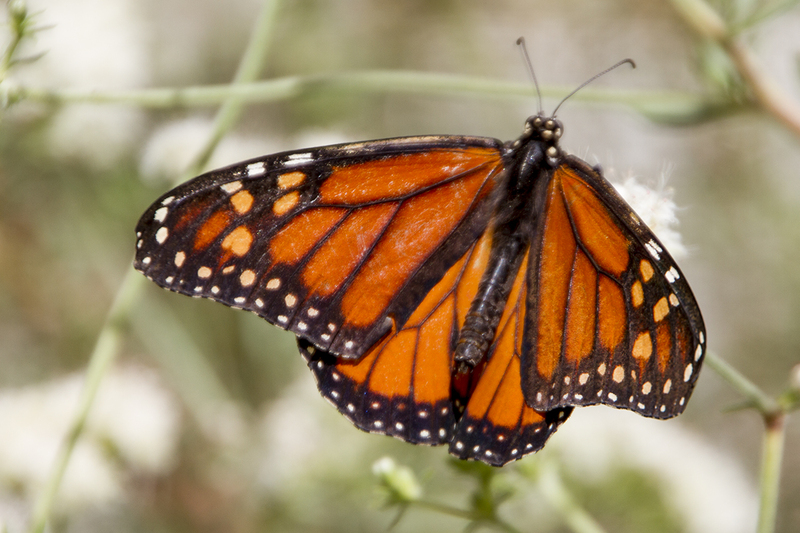 The brand is the brainchild of Dr. Andrew Weil, the author of numerous books including 8 Weeks to Optimum Health. 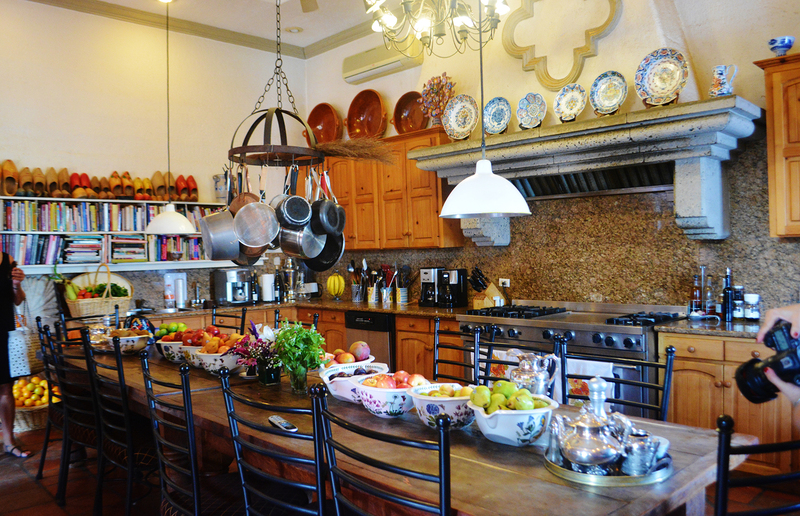 Each chef hired spends a full two months learning the True Foods’ menu before they enter the kitchen. Salads change with the season, too. 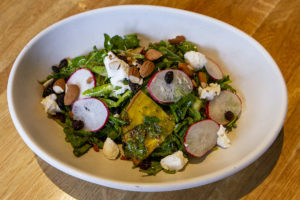 Loaded with nutrient density, the spring salad contained grilled broccoli, blanched asparagus, summer radishes, black raisins, green garbanzos, goat cheese and sprouted almonds with a turmeric and chia seed vinaigrette and golden beets for a bit of texture and sweetness. Chock full of ingredients I normally don’t care for, it was absolutely delicious. 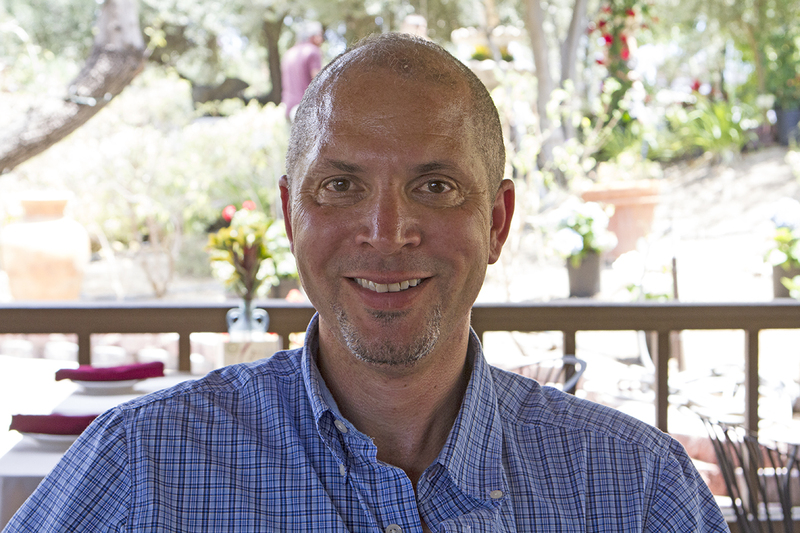 Larry is a walking encyclopedia when it comes to True Food Kitchen, explaining each ingredient and its purported health benefits. 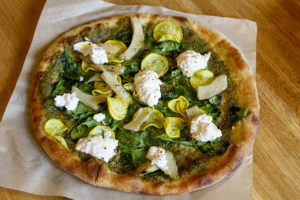 Three entrées were presented: pizza with house made crust using three different flours, spelt, ancient grains and flax. Black walnut pesto was the base, topped with fresh spinach, cured yellow squash, grilled artichoke hearts and then cooked. Once out of the oven, house made almond lemon ricotta and aleppo peppers are added. Miso-glazed eggplant was next with the eggplant at the bottom along with truffle tahini. 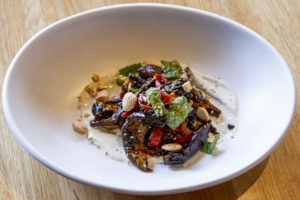 It’s topped with miso marinated roasted eggplant, oven-roasted sweet red pepper and black lentils all tossed together and garnished with marcona almonds, a bit of fresh mint, sesame seed and black walnut pesto. Finally they offered true-farmed striped black sea bass from Baja California. cooked skin down with house made dashi, the bass is laid on a bed of black and red lentils. You’re expected to eat the crispy skin which is loaded with nutrients. 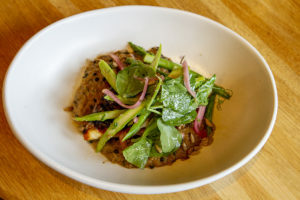 It’s grilled to order with oil and salt and topped with a small salad of watercress, blanched asparagus, house pickled red onions and summer radish tossed in a lemon garlic dressing. It was almost time for dessert when someone in the group asked Larry to tell us about what we were going to finish with. He politely declined, saying you needed to see and smell each dish in order to fully appreciate it. 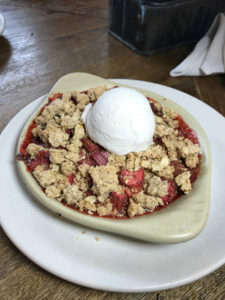 Brittany brought out a strawberry rhubarb crisp with chia seeds. 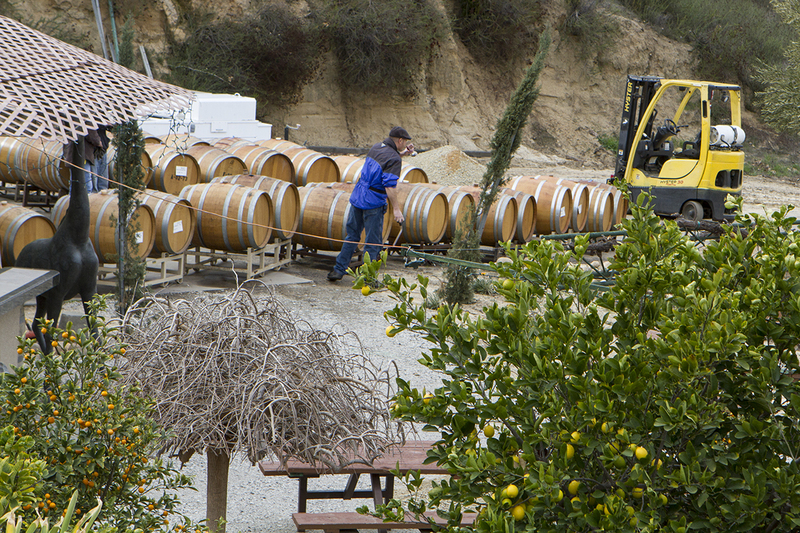 The fruit is macerated overnight which tenderizes it. It’s topped with a gluten-free almond flour crumble and finished with vegan vanilla ice cream made with rice milk and coconut cream. Decadently delicious, it’s 100% vegan and gluten-free. They offered suggested cocktail pairings. 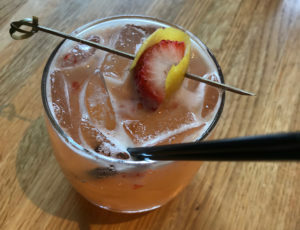 I chose the Basil Cucumber Collins with the asparagus toast and salad and the Strawberry Smash with the main courses. They tasted fresh and delicious and paired delightfully well with the food. 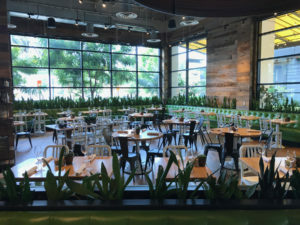 I was thoroughly impressed with True Food Kitchen. The attention to detail in every aspect is clear. I never knew that eating healthy could taste so good. 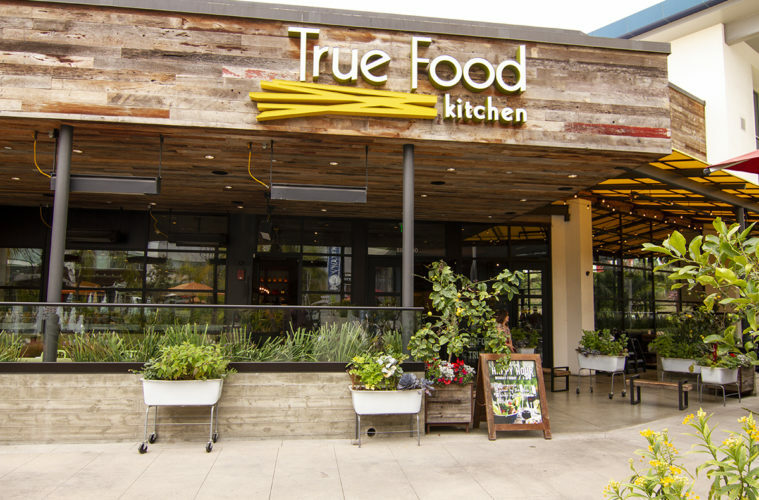 Open Monday through Thursday from 11 – 9, Saturday from 10 – 10 and Sunday from 10 – 9, True Food Kitchen is located at The Point at 860 South Sepulveda Boulevard in El Segundo.